I don’t know about your house, but my house is a sauce house. We love sauces and saucy recipes, so I’ve made you a sauce-lover’s recipe list so you can share my love for BBQ sauces, cream sauces, chili sauces, chocolate sauces, fruit sauces, and more. 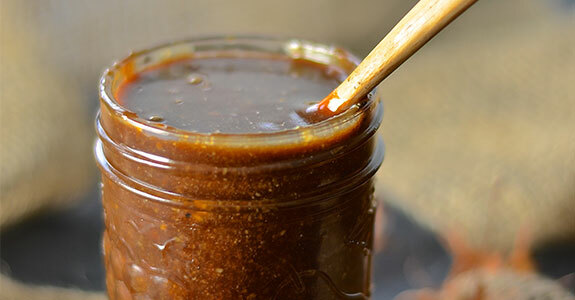 I have several BBQ sauce recipes I use at different times to suite my tastes and ingredients, and I truly believe you can never have enough of these. 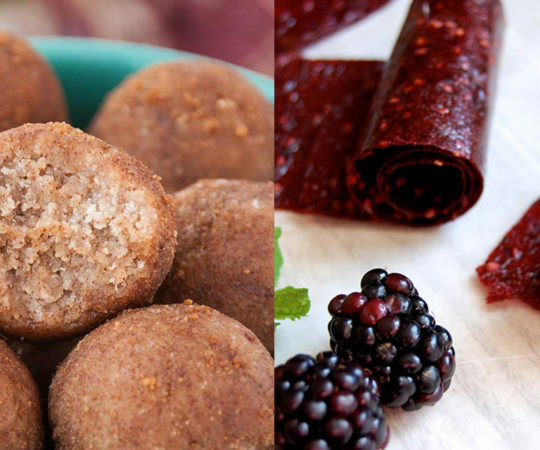 This one sweet and smoky with simple ingredients like tomato paste, medjool dates, juice, apple cider vinegar, seasonings, and liquid smoke. 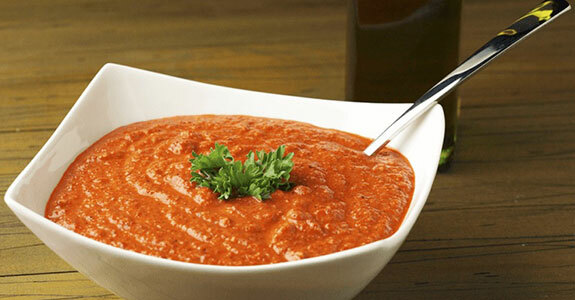 My life changed when I learned how to make homemade roasted red pepper sauce, and yours will too. 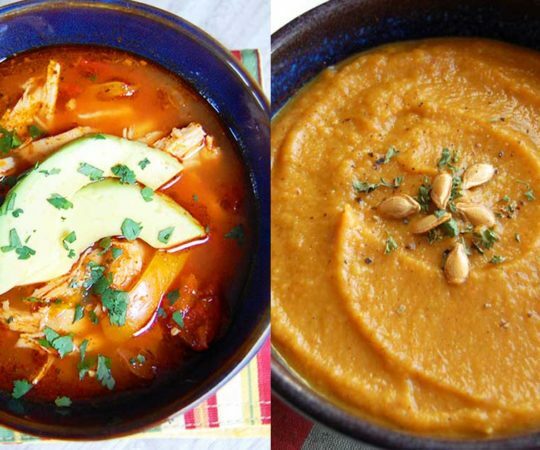 This version is so easy with a jar of roasted red peppers from the store, almonds, salt, pepper, paprika, cayenne, garlic, olive oil, and dried parsley. So simple and so yummy. 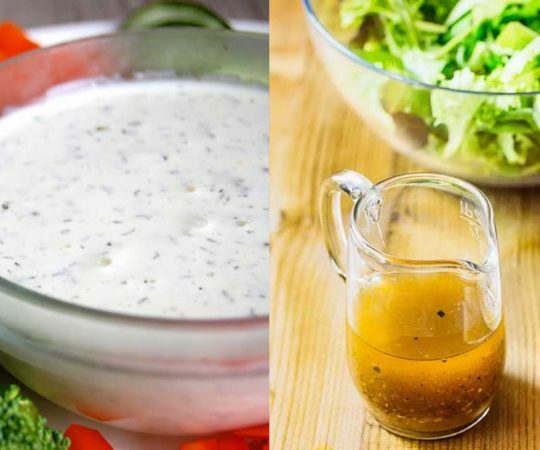 This amazing sauce is full of bold flavors and is great on everything from fish to paleo chips and veggies. You’ll need flat-leaf parsley, egg, garlic, anchovy fillets, olive oil, red wine vinegar, salt, black pepper, red pepper flakes, and capers. This is your new favorite sauce. This is a saucy recipe that’s dependent for flavor on the luscious combination of coconut aminos, honey, tomato sauce, and a touch of arrowroot to thicken the sauce. Take note that all the paleo options are in parentheses, so read carefully when you’re shopping for ingredients. In this recipe, parchment seals in the flavors and moisture so the fish cooks up so yummy. My favorite part of this recipe is the ginger-garlic sauce, which is rather unique for this kind of dish, with lime and toasted sesame oil. You can replace the soy sauce with coconut aminos. This is a simple pesto recipe that’s unlike any you’ve had. 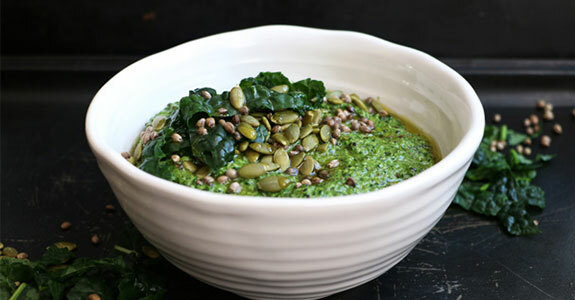 It’s basil and herb free, because it’s made instead with Tuscan kale, and it’s an incredibly healthy sauce for veggies, meats, paleo pastas, and more. You’ll need hemp and pumpkin seeds, garlic, olive oil, lemon juice, sea salt, and black pepper. 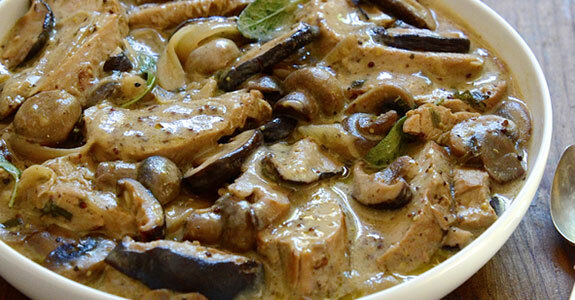 Cooked in a thick sauce with garlic, sliced white mushrooms, Marsala wine, balsamic vinegar, coconut milk, and parsley, this dish is slow-cooked for flavor and can be served on its own, over paleo pasta, zoodles, mashed potatoes, cauliflower rice, or anything you like. Beets have a strong earthy flavor that many people love, but is often best balanced by other flavors—in this case, zesty cilantro and creamy tahini. Make this dish with lemon juice, extra virgin olive oil, garlic, fresh chili peppers, and more. It’s easy, delicious, and so healthy. This chicken is cooked in a skillet in a sweet sauce of orange juice, balsamic vinegar, honey, dried rosemary, minced shallot, cinnamon, and olive oil. Sectioned oranges give it a certain gourmet feel and taste that I love. Serve with veggies and cauliflower rice or potatoes. This dish only has “peanut” in the name for the sake of tradition—no peanuts grace this bowl! 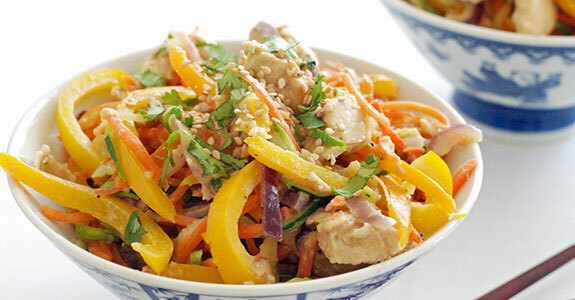 This chicken and veggies dish is delicious with a spicy sauce made with sunflower butter, fresh ginger, garlic, dates, lime juice, sesame oil, red pepper flakes, and coconut aminos. 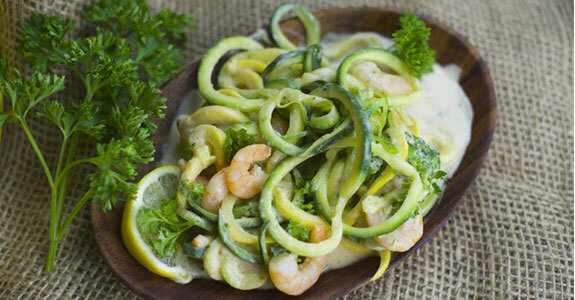 This simple and classic Italian dish is made paleo with zucchini noodles, and consists of the noodles along with clams and onion swimming in a delicious white wine sauce with chili flakes, vegetable stock, garlic, olive oil, and other amazing flavors. Roasted Brussels sprouts are a crispy delight that makes their way onto my table several times a month because we love them so much. This version has a twist, with a creamy cashew curry sauce made with cashews, curry powder, coconut milk, garlic, chili powder, apple cider vinegar, and honey. I’m pretty blown away by this creative recipe, and I want one of these puppies in front of me right now. These soft-roasted sweet potatoes are slightly caramelized and stuffed with ripe bananas and dark chocolate chunks before being drizzled with a silky banana nut sauce made with the nut butter of your choice (I’d pick cashew). No fries are complete without a sauce to dip them in, and I’m partial to BBQ sauces myself. 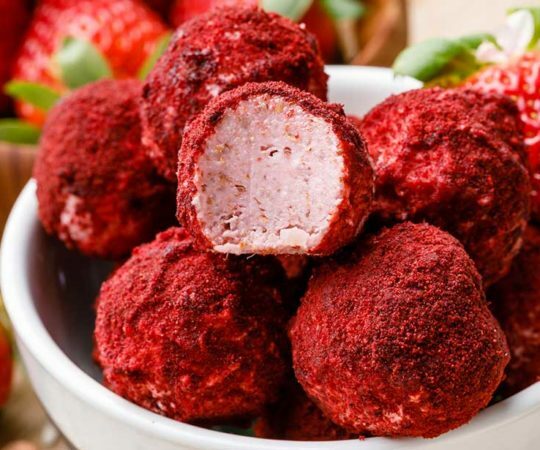 This one is absolutely perfect with tomato paste, tart cherry juice, blackstrap molasses, apple cider vinegar, smoked paprika, liquid smoke, onion powder, and chipotle powder. If you can’t get your hands on venison, I’d use whatever red meat you have to get this on your plate as soon as you can—it’s that good. The port and red berry sauce is so tasty and way simpler than you’d expect, while the steak is cooked in butter and rosemary. See, I told you! 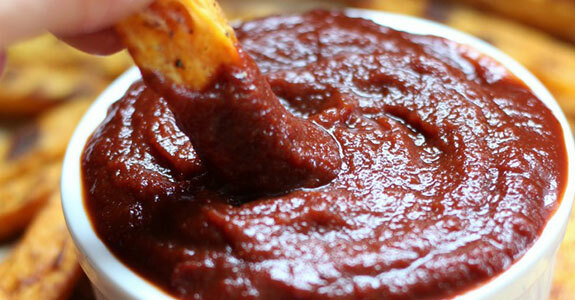 You can never have enough BBQ sauce recipes, because they’re all different. This one uses Worcestershire for a deeply savory flavor and is served with carrot, beet, and parsnip “fries” seasoned with thyme, paprika, and cayenne. We all know the feeling—you need chocolate, and you need it now. Whether the kids are going wild or you just got home from a stressful workday, this is just the ticket with a raw cacao powder, coconut oil, and raw honey sauce over fresh or frozen berries. This super simple dish can be yours in a few minutes for an easy lunch or dinner. The shrimp is cooked with garlic, red pepper flakes, broccoli, parsley, and summer squash with Cajun seasoning. The cashew cream sauce is only two ingredients! This spaghetti squash is served in a sauce of butter, wild mushrooms, chopped walnuts, kale, fresh thyme, nutmeg, and fresh oregano. Use full-fat coconut milk instead of cream, and feel free to just leave out the goat cheese. I’ve been making my own tomato sauces for a few years now, and once I figured out how, I never looked back. This is one of my favorite pizza sauce recipes because it’s so easy. All you need is fire roasted tomatoes, tomato paste, dried oregano, garlic powder, and a few other seasonings. Paprikash is the ultimate in sauciness, and this simple recipe is going to become one of your favorites. It’s made with olive oil chicken breasts, onion, garlic, sweet paprika, chicken broth, crushed tomatoes, and coconut milk. You probably already have the ingredients! 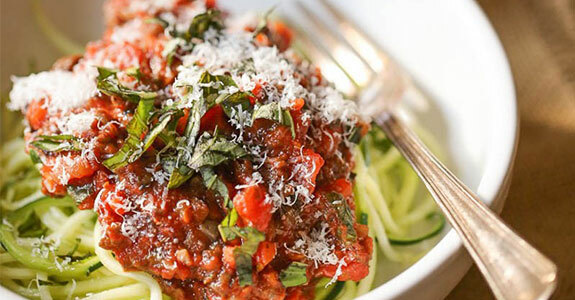 The Bolognese sauce is totally vegan, so you can serve it to your non-meat eating friends and no one will miss the beef. You’ll need zucchini, Portobello mushroom caps, carrot, celery, yellow onion, garlic, tomato paste, crushed tomatoes, and herbs like oregano and basil. This is one of my favorite BBQ sauces because I love the ones made with fruits. For this sauce, you’ll need crushed fire roasted tomatoes, tomato paste, apple cider vinegar, molasses, frozen dark sweet cherries, salt, hot sauce, maple syrup, garlic powder, and ground cumin. This pesto uses shallots, garlic, cashews, basil, nutritional yeast, and olive oil. The nutritional yeast and cashews give it a creamy flavor and texture that is uncommon in pesto sauces and turn this dish into a deluxe comfort food with spiralized zucchini and veggies. Everyone needs a decadent fruit dip or sauce recipe, and this is one of mine. It’s made with coconut cream, pure vanilla extract, dark chocolate, and unsweetened cocoa powder. You can replace the can sugar with coconut sugar, which will even create a darker chocolate color. 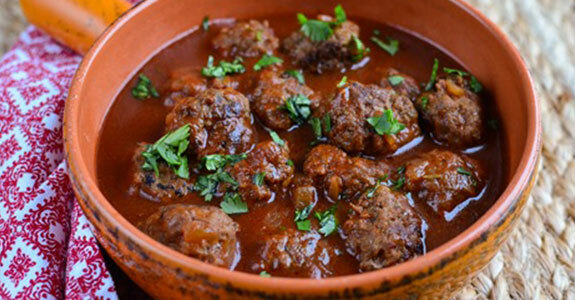 Just like sausages, meatballs are extra good with a hint of sweetness in them. This recipe is for a super savory meatball with beef mince, red pepper, red onion, garlic, and herbs. It’s served in a sweet-and-savory maple tomato passata sauce with balsamic vinegar. While this sauce is intended for pizza, you can also use it on any paleo dishes calling for some sort of tomato sauce or dip. It’s so yummy and easy to make with olive oil, garlic, tomato, crushed tomatoes, oregano, basil, sea salt, and ground black pepper. The combination of these pancakes and this sauce will remind you of the ever-popular but so-not-paleo Nutella spread. 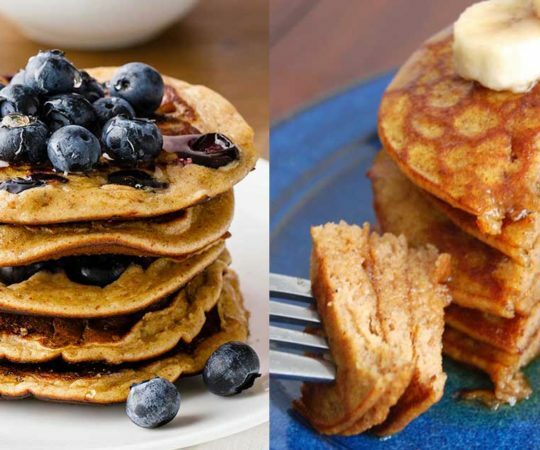 You’ll need hazelnut flour, honey, coconut milk, eggs, maple syrup, cacao powder, vanilla extract, and a pinch of sea salt for both the sauce and the pancakes. This easy little shooter dessert involves layering delicious chocolate coconut cream with a homemade sauce using frozen raspberries, maple syrup, orange juice, orange liqueur, and arrowroot to thicken (use it to replace the cornstarch). It’s a beautiful presentation, too! Using a thick and delicious sauce, this casserole turns ordinary pork and mushrooms into pure magic. You’ll need Dijon mustard, garlic, mushrooms, sage leaves, butter, wholegrain mustard, lemon juice, stock, and coconut milk to replace the cream. This completely paleo and vegan comfort food meal is creamy, warm, savory, and totally amazing. Make it with spiralized zucchini, sea salt, canned pumpkin, cauliflower, cayenne, cinnamon, butter, garlic, torn kale, and toasted pumpkin seeds. These crunchy chicken beauties are made with pistachios and served with a pretty pink raspberry and honey mustard sauce, which also serves as the glue to hold the crushed pistachios onto the chicken, imparting fruity and spicy flavors from the beginning of cooking to the end. This almost-instant pizza sauce completely destroys any excuses you’ve ever used for not making your own sauce. Make it with olive oil, garlic, canned diced tomatoes, dried basil, dried oregano, and dried thyme. 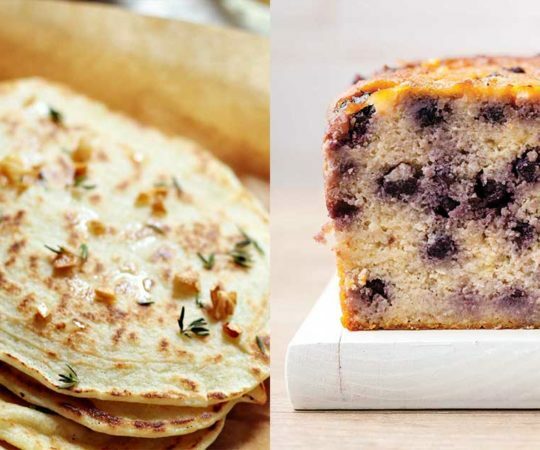 Because it’s made with pantry ingredients, you can always keep them on hand. This sauce is both paleo and vegan, with coconut sugar, tahini, coconut oil, and salt. The tahini is an ingredient I’ve never seen before in a caramel sauce, but it’s the secret to making this sauce super rich, thick, creamy, and decadent. Watch out, it’s dangerous addictive. You can’t go wrong with a good Hollandaise sauce, and let me tell you: THIS is a good Hollandaise sauce. The recipe includes potato (sweet or white, your choice), artichoke hearts, baby spinach, salt, pepper, cayenne, butter, lemon juice, eggs and yolks, and vinegar. This chicken is served in an amazing creamy basil sauce with yellow onion, garlic, coconut oil, sunflower seeds, nutritional yeast, basil, avocado oil, salt and pepper, coconut milk, arrowroot powder, and sliced cherry tomatoes. It’s so easy and so delicious. Chimichurri sauce is something like pesto, but even more herbal and a little bit spicy. This one is so creamy with cilantro, Italian parsley, oregano, garlic, lemons, red pepper flakes, roasted cashews, and almond milk. Those last two ingredients are the secret to creamy goodness. 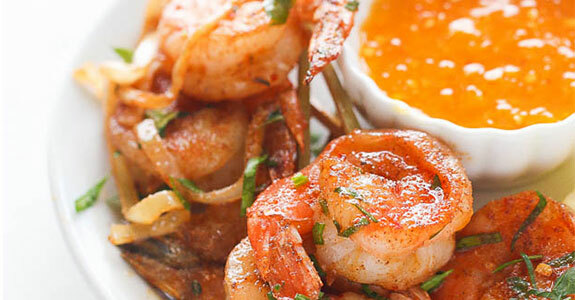 Everyone knows shrimp is best with butter, and this butter sauce doesn’t mess around. You’ll need butter (duh), onion, garlic, fresh lemon, Jerk spice, salt, parsley, Caribbean pepper sauce, and extra large shrimp. Skewer those babies and drown them in butter. This delicious cake is rich and fudgy with coconut flour, unsweetened coconut powder, baking chocolate, applesauce, sea salt, and vanilla. Sweet it with coconut sugar and top it with a delicious homemade raspberry sauce, because raspberry and chocolate together is perfection. For years I looked for a sweet chili sauce made without corn syrup or white sugar, to no avail. When I gave up and made my own, I used this recipe, and I wish I’d tried it sooner! It’s delicious with chargrilled capsicum, red chili, roasted garlic, ginger, maple syrup, and lime.